VISINE® DRY EYE Relief contains 10 ingredients found in your own natural tears and helps moisturize and soothe dry eyes, and protect them against further irritation. So, no matter what you’re viewing, there won’t be a dry eye in the house. If pregnant or breast-feeding, ask a health professional before using. Keep out of reach of children. If swallowed, get medical help or contact a Poison Control Center right away. 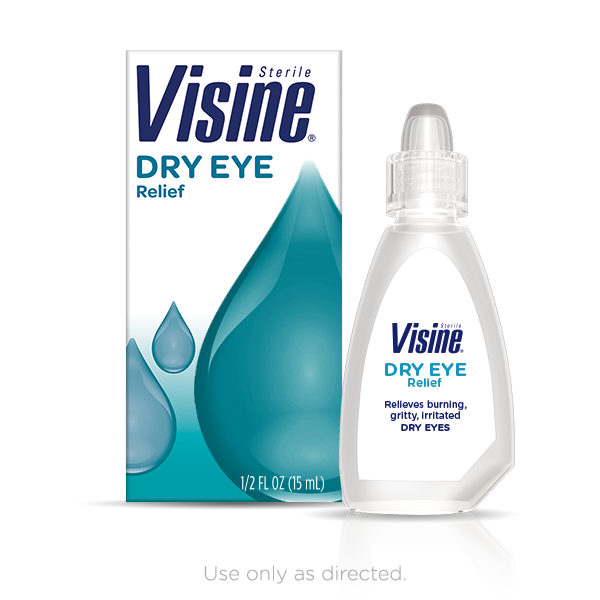 it helps me with the dryness on my eye! i like this product ! This product provides my eye with quick dry eye relief. I just had cataract surgery on both eyes; and this product has been able to provide quick relief from dry eye symptoms. Thanks for your feedback. We're sorry to hear that you experienced dry eyes while using our product. We'd love to gather more information and see how we can help improve our products. When you have a moment, give us a call at 1-888-734-7648. We're available Monday through Friday from 9am-5:30pm EST. We look forward to speaking with you! Is it suppose to sting my eyes? I thought it was suppose to sooty them. Will return product. We'd like to learn more about your experience and see how we can help! Please give us a call at 1-888-734-7648 from 9AM - 5:30PM ET, Monday through Friday. We look forward to hearing from you. The past few days I have been having horribly dry eyes. I noticed my previous drops from a different company had expired. I wanted to try something new; however, I have had to reapply four times in just two hours. These drops wear off extremely quick. I will go back to paying more for drops that burn like Hades when applied yet last longer than these. Also, an adult that could barely open your childproof cap. I appreciate safety; however, it is pointless when it hinders users from using the product. We're so sorry to hear about your experience! We'd like to chat more and help make things right for you. Please give us a call at 1-888-734-7648 from 9AM - 5:30PM ET, Monday through Friday. Thank you! I hate your Youtube commercials so much I am actively boycotting all your products. I researched drops for dry eyes. These had safest ingredients. I tried them first and was amazed at how "calm" they made my eyes feel all day. The product is aptly named! I then bought bottles for Mom and Dad who are in the 90's. Like me, they had been using other drops and were also pleased with the difference these drops made. The only problem is that they are out of stock in many places. What's the story? I hope they are not discontinued this product! So, everyone once in a while, I have a problem where it feels lol I have sand in my eyes. And my god, does it hurt. It is literally the most irritating feeling in the world. Usually happens when I wake up in the morning and still feel really exhausted. I have tried other eye drops and I have literally tried think of sad things to start crying to see if it would help. Sometimes they do, but usually it's back within a few hours. I'm trying these out now, and while my eyes still feel tired ( I definitely need to get to sleep earlier than midnight. And having a desk job where i am on the computer all day, definitely does not help) the grainy sand feeling has gone away. One eye, it was gone with one drop, the other took two. But I feel so much better. Will post an update later though to review on long term relief. However, relief is definitely instant and I have no problems with being able to see or having cloudy vision afterwards. Purchased from CVS, and the cashier have me a guarantee that if I have cloudy vision or they don't work the first time I use them, to bring the back and they will refund me and help me find the best one.